If you want "WOW!" packaging that makes an effective walking billboard that customers will reuse over and over again, AND shows your commitment to the environment – check out our RE-BAG reusable shopping bags. 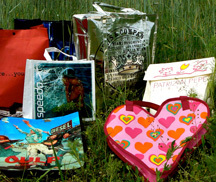 Made from your choice of eco-friendly materials, our Re-Bags are custom made to your exact specifications and printed with your own high impact graphics. With a 3,000 to 6,000 piece minimum order depending on the material used, you can create a perfect promotional/marketing piece or even product packaging (POP) – the possibilities are endless. These imported bags are amazingly competitively priced AND most of our Re-Bags are CARBON REDUCED thanks to CARBON OFFSETS from Climate Care! Julie is Re-Bag’s USA Representative so contact her for your Re-Bag quote today. Check out www.re-bag.com and prepare to be blown away! Open top, Velcro closure, zippered closure, snaps, etc. See our Sustainability / Green Packaging Options page for additional info on the GREEN features of our Re-Bags.